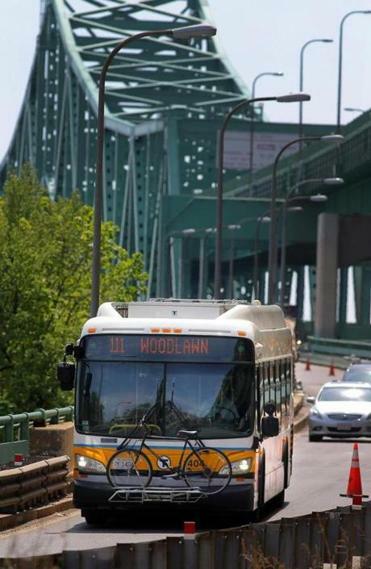 A 111 bus exits the Tobin Bridge into Chelsea. State officials are advising motorists that construction work on the Tobin Bridge starting next month will result in lane closures and traffic delays for the next two years. The Massachusetts Department of Transportation is rehabilitating the bridge surface and undertaking required maintenance to the structure, which will require lanes to be closed, causing traffic impacts on the bridge and the Chelsea Curves section of Route 1. Officials said drivers and MBTA customers should be prepared for increased travel times on north and southbound sections of Route 1. Lane closures on the bridge’s northbound side begin April 1. One of the three lanes will be closed during the day and two at night. Starting in early May, one southbound lane and one northbound lane in the Chelsea Curves area will be closed during the day, and two lanes on each side will be closed at night. During construction, free fares are being offered for Silver Line 3 inbound bus customers at certain stops, and the Blue Line will have added train capacity. In addition, commuter rail customers will be able to use a CharlieCard to travel between North Station and Chelsea. “MassDOT is carrying out simultaneous work on this infrastructure, which was constructed in the middle of the 20th century and hasn’t been rehabilitated since the 1970s, in order to ensure its continued use and reliability and minimize the overall impact on commuters and the local community,” state Highway Administrator Jonathan Gulliver said in a statement.